* for 9,90 Euro only. The closest date: April, 15,2015, 5 pm (UTC). Starting a project is a complex task. The most part of future problems have their roots in the lack of an initiation procedure. So one of the main tasks while initiating project is to collect, analyze and balance a wide range of requirements from different stakeholders. By aligning stakeholder requirements, constraints and assumptions, we make our project goals realistic and achievable. At the webinar you will learn how identify stakeholders, collect their requirements, resolve conflicts, and finally create the stakeholder requirement matrix and define project goals. The course is based on the PMBOK v.5 “Stakeholder management” knowledge area and PMI Business Analysis syllabus. Important! 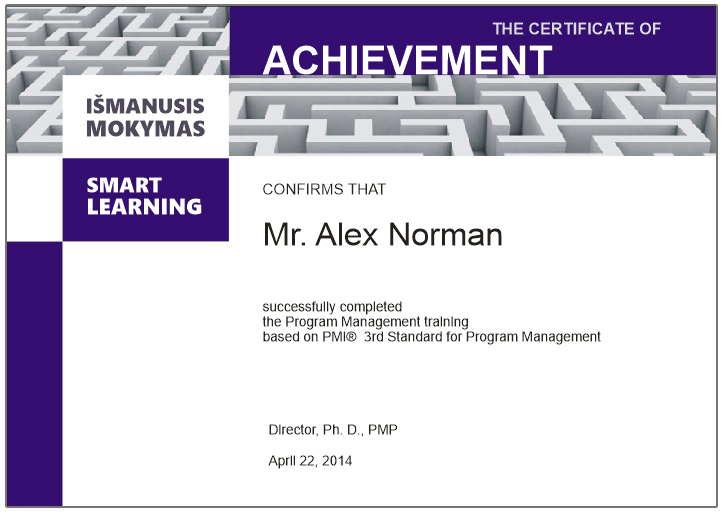 1 PDU is granted for webinar attendance, proved with a certificate (category B for PMP/PgMP/PMI-BA). Presenter: Danil Dintsis, Ph. D. (in System Analysis and Management in technical systems), IT manager with 10+ years’ experience, including projects and portfolios with Microsoft, Citrix, Siemens Telecom. Certified specialist in Project management (PMP®), IT service management by EXIN® (European Information Institute). # Title Description/Content Duration, min.